Integrate sales, marketing and customer service with your financials to close more sales and improve customer loyalty. Utilize a self-service customer portal to provide easy access to often-requested information. The Customer Management Suite provides a web-based customer relationship management (CRM) application for managing leads, contacts, opportunities, and business accounts. Financials and content management that are integrated foster a team approach and deliver a single consolidated view of all customer contacts. Dashboards and reports provide real-time sales data to accurately manage forecasts, quotas and results. Respond rapidly to customers from the time they enter your website, through the sales process, billing and during customer service requests. An out-of-the box, self-service customer portal allows you to offer customers access to the financial and case information you choose. Gain a complete view of your business — integration with financials gives you reports that link marketing campaigns to account profitability. Collaboration features are easily shared by all to promote a team approach to customer management. Unlimited server pricing allows customers to involve everybody in automated workflow processes. Check out the Customer Management Suite datasheet for a complete listing of all modules. 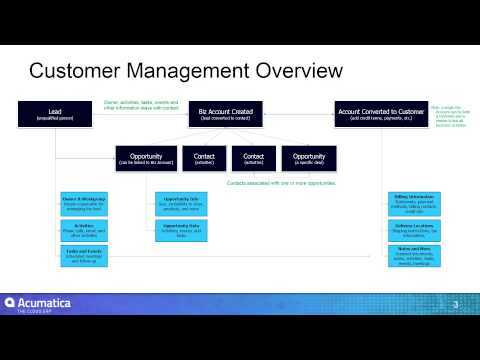 This video provides an overview and high level discussion of Acumatica CRM architecture.